Earn $24.50 in Rewards credit (2450 points) What's This? The Speedplay Zero Aero Stainless Pedals are the ultimate high-performance aerodynamic pedal system. 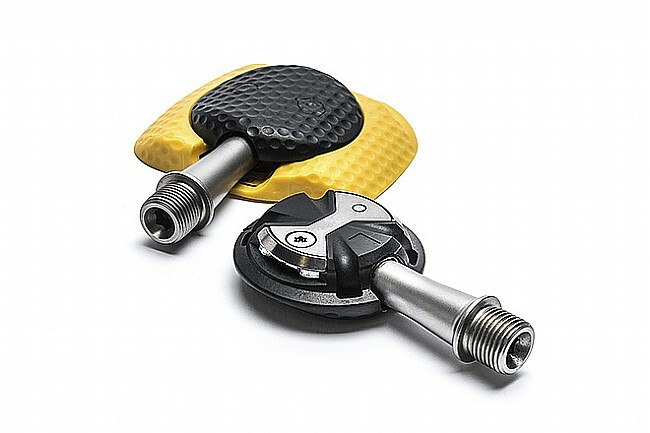 Designed from the ground up to deliver wind-defying, efficient pedaling, Speedplay takes their unique double-sided road pedal and fine-tuned it for high performance. With a fully adjustable cleat, fine tune all three different axes without repositioning the cleat itself. Fore-aft, side-to-side, and rotational foot positioning can all be set quickly and easily to provide the kind of precise fit that's needed to conquer the pro peloton. The Speedplay Zero Stainless Pedals include their revolutionary new Aero Walkable™ cleats. The thin cleat profile is topped by a dimpled, rubberized cover that simultaneously protects the cleats and provides a grippy ramped surface that provides a highly walkable surface, while helping to form a seamless aero surface on the bottom of your shoe. The Speedplay Zero Stainless Pedals feature a stainless steel spindle, weighing in at 210 grams for the pair, while the Aero Walkable cleats weigh 80 grams (4-bolt) or 130 grams (3-bolt).